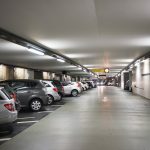 External car park lighting requires careful designing to provide ample lighting while minimizing energy consumption. The amount of light used, efficiency of accessories and landscaping are some of the considerations to make. This guide provides the best practices required to achieve this objective. Whenever presented with a parking light project, the first step is to determine the lighting level appropriate for the space. Knowing the capacity and the parking lot traffic is crucial to the design. A good practice is to use 5 lux for 100 spaces of small traffic and 10 lux for 500 parking spaces. For large parking lots with heavy traffic, not less than 20 lux of lighting should be used. All lighting must be maintained at least 0.25% overall uniformity. Lighting requirements at external car parks are highest from evenings till dawn. Controlling the amount of light available during the day is therefore necessary to save on energy and extend the life of the elements. Intelligent lighting circuits as well as LED lights have proved effective for such applications. These work by tracking the natural light and only illuminating the necessary amount of light. Attaining the clarity of the natural lighting should be the objective of any external car park lighting design. White light not only makes items visible from a distance but also accentuates landscaping. This light also makes CCTV footages more clear, a step to combating parking lot thefts. To meet this objective, lights of 4000K lumens or warmer are used. Additionally, a minimum of 70Ra color rendering should be used. In lighting, glare is considered a form of environmental pollution. Excessive glare is also an indication of energy wastage and should be avoided in all designs. An adage in external lighting is to produce the right amount of light at the right place and time. If for any reason glare is unavoidable, lighting accessories such as optics and shields should be incorporated to minimize glare. Once all the aspects for proper parking lot lighting are considered, the next step is to come up with the best design. High masts may be used but with considerations to achieve uniformity. Most park users prefer lower luminance with uniformity than concentrated light only at the center. Proper lighting design also avoids illuminating to other people’s backyards or windows. This can be achieved by light brackets that have no inclinations and avoiding light sources with upward illuminations. Incorporating the parking lot landscape to the overall lighting design is key to the success of a project. This eliminates the possibility of lighting posts interfering with space usage or the landscaping attributes of the field. Additionally, there should be light sources near entrances and sign boards. It is possible to create clutter if landscaping is not factored. Many companies are embracing green technologies. They have realized how much these can help them to reduce their operating expenses. It surely doesn’t hurt that they can help to preserve the environment in the process. 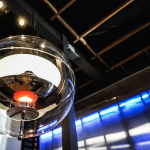 Among the most popular changes being made by enterprises has to do with lighting. Aside from the heating and cooling system, this is the single biggest energy draw in most buildings. This is not an easy project, however. There could be hundreds or even thousands of individual lighting fixtures, depending on the size and complexity of the whole structure. It is for this reason that the job is often given to turnkey LED lighting Oklahoma specialists. The process will always start with an audit. A technical group will be sent to survey the situation and note vital details that will affect the project. They will note the exact parts of the facility that will require a refit, as well as any challenges that may be present. They will go in depth with a comprehensive engineering study of the site and justify the investments that will be made for retrofitting. This is not a trivial process. The expenses will be significant. Therefore, it is absolutely necessary for the management to see why it has to be done and what they can get in return for the money spent. After all of the economic and technical details have been sorted out, the lighting company should be able to come up with a viable proposal that can be presented to the management. This must contain a concrete plan of the refit including the specifications of the new technologies to be used and how they can lower energy consumption. This should also have a discussion of the sensors and controls that can minimize energy waste. Each zone will have its own distinct approach since they have their own purpose and conditions to consider. Of course, the aesthetics of the place must also be factored in. Once the proposal gets approved, it will finally be executed in real life. The lighting company will assign an experienced project manager to oversee the project from beginning to end. There is no need to worry about anything as the skilled technicians will do all the work. They will try to be as discreet as possible so as not to affect the operations. This means scheduling the installations outside of office hours and on weekends, whenever possible. Those who are occupying the building can just focus on their jobs without worrying about the changes being made.